Buddhists use a series of stylized, ritualistic hand gestures known as mudras in their practice. Each mudra has a specific meaning and connotation, and Buddhists may keep figurines and artwork of the Buddha performing these mudras around the home. Buddhists often form the hand gestures during meditation practice or in other observances. Buddhist artwork has a long history of use in feng shui practice, where sculptures, wall hangings, pictures, and candleholders depicting the Buddha performing various mudras are used to manage energy in the home. 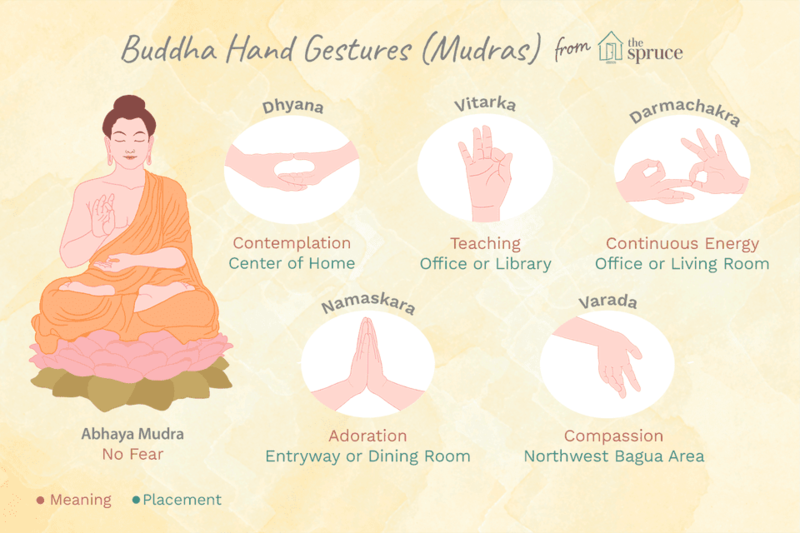 Here are 10 of the most common Buddhist mudras, with explanations of how they can be used to create good feng shui in the home. Abhaya is a Sanskrit term that is translated as fearlessness. The abhaya mudra is made with the open palm of the right hand extending outwards at the chest level or slightly higher. If you look at this Buddha hand gesture, or mudra, you will also feel the energy of protection, peace and a sense of strong, deep inner security. Abhaya mudra is a powerful feng shui decor addition to any home. It is best placed near the main entrance to your home, or in the living room. The dhyana mudra (also called the samadhi mudra) is a hand gesture that promotes the energy of meditation, deep contemplation and unity with higher energy. It is formed with upturned hands overlapping one another with the thumbs lightly touching. The circling of energy created by this triangular shape promotes a cleansing of any impurities. Just by looking at this Buddha hand gesture (let alone practicing it) one can connect to the energy of deep peace and serenity. The best locations for images of the dhyana mudra are in the mediation room, near your alter, in the center of the home, or in the study. Namaskara mudra (also called anjali mudra) is a hand gesture used to greet another being with the utmost respect and adoration for the Divine in all. The greeting is expressed in a form of prayer coming from one's heart or the third eye. The namaskara mudra can be depicted with palms at the heart level or at the forehead. This is because it is only the heart or the deeper spiritual inside of the third eye that makes it possible to see that we are all expressions of the same light. It is said that that true Buddhas no longer make this hand gesture—possibly because once you are united with the light of divine energy, there is no longer a need to express adoration for it. The best feng shui placements for images of the manaskara mudra are the main entry, the dining room, the living room, or the home office. Bhumisparsa mudra is translated from the Sanskrit as touching the earth or calling the earth to witness the truth. This mudra is always depicted with the left hand facing upward in the lap (varada mudra) while the other hand points downward, touching the earth. Bhumisparsa mudra is said to have been the Buddha's hand gesture when he achieved enlightenment. At the point where the demon Mara attempted to corrupt his resolve, the Buddha is said to have touched the ground, indicating that the earth itself was bearing witness to his victory over the darkness of delusion. The bhumisparsa mudra, then, is nothing less than a commemoration of the Buddha's enlightenment. The best feng shui placements for images of the bhumisparsa mudra are the center of your home, the main entrance, or the alter. Varada mudra expresses the energy of compassion, liberation, and an offering of acceptance. This mudra is made with the left hand extended and facing downward, with the palm facing out. It is often seen in conjunction with other mudras, such as the bhumisparsa or the abhaya mudras. This mudra is also called a boon-granting mudra because it helps bestow a specific quality of energy one might be seeking from an enlightened being. Often you can see a sacred shape, such as a mandala or an eye in the palm of the Buddha hand. This expresses further the rarefied and powerful energy emanating from an enlightened being through his or her hands. The best feng shui placement for a Buddha exhibiting the varada mudra is in the northwest bagua area of your home or office. Karana mudra expresses a very powerful energy that is able to expel negative energy. This hand gesture is also called warding off the evil. You can sense a very determined, focused energy just by looking at this hand gesture. It is made with the hand extended and fingers pointed upward, with the middle two fingers folded and the thumb touching the tip of the second finger. If you have an image of the Buddha making the Karana mudra, be very mindful about its placement, be it in a home or office. You do not want it to face the front door (which should have welcoming energy). By the same token, you do not want it in your bedroom or your child's room. The best feng shui placement is in a bagua area that needs strong clearing, or in a problematic area of the house—such as near windows facing a low-energy alley. Typically translated as the mudra of unshakable self-confidence, this hand gesture evokes so much more than simple self-confidence. The words that come to mind when looking at this beautiful Buddhist gesture, which involves crossing the open hands over the heart, are: "I come with peace because I am peace." In some representations, the fingers are interlaced with the thumbs pointed toward the collar bones. Vajrapradama mudra emanates a glowing river of beautiful golden energy that is very healing and ever-lasting. This is not just a gesture of individual self-confidence, but of the universal Self that represents the divine energy. When this confidence is there, the heart becomes the strongest communicator. This is what this mudra evokes—the strength and confidence in the heart-self. The best feng shui placement for an image of the vajrapradama mudra is the center or heart of the home, the living room, and the main entrance. Vitarka mudra is considered as the hand gesture that evokes the energy of teaching and intellectual discussion or argument. It is made with the palm facing outward at chest level, with the tip of the thumb touching the tip of the index finger. It feels like the transmission of a particular teaching with no words, creating a constant flow of energy and information. Similar in nature to abhaya mudra, the energy created by this hand gesture allows for the transmission of knowledge in a protected way, without being hindered by fear. The best feng shui placement for an image of the Buddha making the vitarka mudra is in the home office, library, or study. The dharmachakra mudra expresses the continuous energy as symbolized by a wheel/chakra of the cosmic order. The hands are placed at the heart level with the thumbs and index fingers forming circles (similar to vitarka mudra). The right palm faces outwards and the left one faces towards the heart. The circle represents the wheel of dharma. This mudra is associated with Buddha's first sermon or teaching. It symbolized the fact that that the teachings on the cosmic order comes from, or through, the heart center. The best placing for a Buddha image exhibiting the dharmachakra mudra is the home office or living room. The uttarabodhi mudra is called the mudra of supreme enlightenment. It is formed with both hands placed at the heart; index fingers touching and pointing upwards, the other eight fingers intertwined. It is a hand gesture that clearly evokes a sense of unshaken unity, as the individual self aligns with the One source. Performing the uttarabodhi mudra for a few minutes creates an easily perceived shift in subtle energy within the body. The best feng shui placement for an image of the uttarabodhi mudra is in the north or south bagua areas of the home or office. You can also place it in a prominent, high energy spot in your living room.